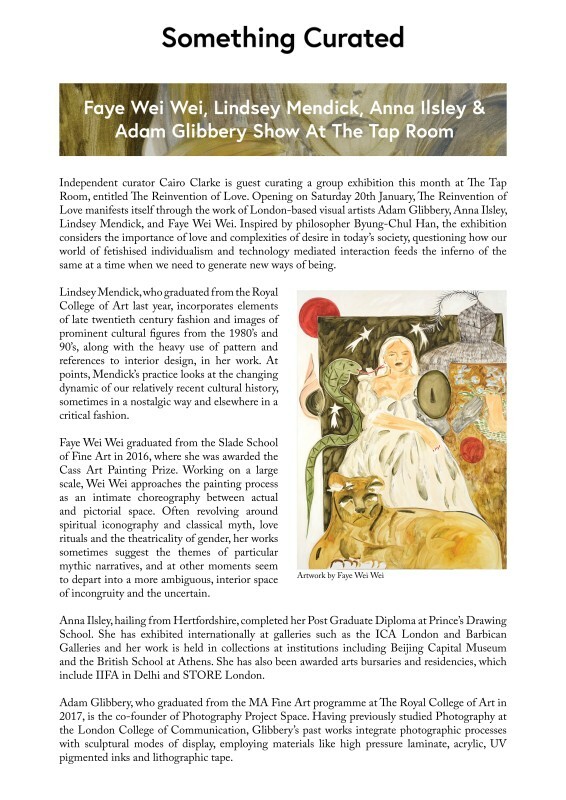 Independent curator Cairo Clarke is guest curating a group exhibition this month at The Tap Room, entitled The Reinvention of Love. Opening on Saturday 20th January, The Reinvention of Love manifests itself through the work of London-based visual artists Adam Glibbery, Anna Ilsley, Lindsey Mendick, and Faye Wei Wei. Inspired by philosopher Byung-Chul Han, the exhibition considers the importance of love and complexities of desire in today's society, questioning how our world of fetishised individualism and technology mediated interaction feeds the inferno of the same at a time when we need to generate new ways of being.